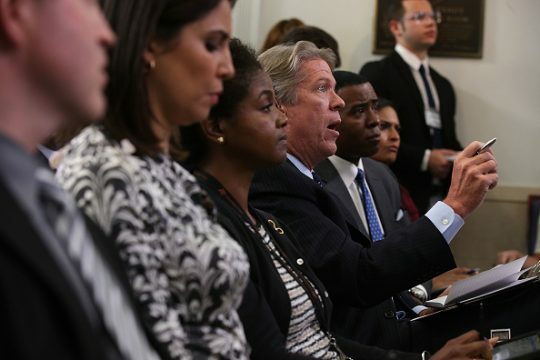 CBS White House correspondent Major Garrett implicitly criticized colleague Jim Acosta's conduct in a new interview, noting he gave up the microphone when told to by the president at a recent press conference. He said in a separate interview that the Obama administration would "demonize" Fox News when he worked there, saying there was a precedent to White Houses attacking news organizations. Garrett addressed the situation involving Acosta and CNN, who scored a victory on Friday in their lawsuit over the revocation of Acosta's press pass. A federal judge issued a temporary restraining order to force the White House to give it back, ruling Acosta's due process rights were violated. Acosta, who often runs afoul of Trump and White House press secretary Sarah Huckabee Sanders, refused to give up the microphone to a White House intern while aggressively questioning the president about the migrant caravan and Russia last week. His hand grazed the intern's arm, leading the White House to charge he placed his hands on her in an unacceptable fashion and revoking his pass. Acosta denied it, and other news outlets, including Fox News, stood with him in his lawsuit. Garrett told conservative radio host Larry O'Connor he had asked difficult questions of all four presidents he had covered—Trump, Barack Obama, George W. Bush and Bill Clinton—and while he said he didn't want to criticize how his colleagues acted, he agreed with O'Connor's point that there was a code of conduct for reporters at the White House. "It's the most majestic political place in America," he said in a clip flagged by Mediaite. He noted at a Rose Garden press conference that he thought Trump had called on him, but it turned out Trump meant to call on Kaitlan Collins, coincidentally of CNN, so Garrett gave up the microphone. "Some of my colleagues might say, ‘What did you do that for? You had the microphone, you have a voice, you can speak,'" Garrett said. "The President of the United States said, ‘Not you.' To my way of thinking, that's enough." "Some might say, well, you laid down and were too deferential, I don’t feel that way," he added. "I deferred, hoping he might call on me again. He didn’t. That’s how I orient myself to the institution, and the person who occupies that institution is chosen by the country, and I respect the institution and the country’s choice. And I'm there to, on behalf of everyone, ask questions and, most importantly, get answers." Garrett, who is promoting his new book Mr. Trump's Wild Ride, said in a separate interview with Hill.TV‘s Saagar Enjeti and Krystal Ball on Friday that it should be noted he had his own problems with the Obama White House as a Fox News reporter. He left Fox in 2010 and joined CBS in 2012. The mainstream press was often criticized for being too cozy with Obama, but the president often complained about his treatment at the hands of Fox News. "There was never an effort to shut me out of the briefing room," Garrett said. "There was a war with the network I worked with … The [Obama] White House said it was at war with Fox News. I was its most visible editorial representative on the White House grounds as a senior White House correspondent." "The White House would always pull me aside and say ‘well, really, Major, we're not at war with you,' and I said ‘stop talking to me like that because when you're at war with my network, you by definition are questioning and assailing my journalistic credibility and the work I do here every day,'" he added. " ‘So don't tell me it's not about me. It is about me.'" "They had this sort of arms-length relationship to Fox and tried to demonize it on a daily basis. So that's another part of American history and journalism in the White House press corps I think, at least, should be noted at this moment, that it's not without precedent." This entry was posted in Politics and tagged CNN, Donald Trump, Fox News, Jim Acosta, Major Garrett, Media, Obama Administration. Bookmark the permalink.